I love to use small pieces of leftover fabric to make small quilted projects. One of my absolute favorites has been this coffee press wrap or jacket. It's been such a hit among family members that I am now including it on my 'must make' list for the rest of this year. It's fast, it's frugal and it can be made on a Friday and given away that night as a gift;) This one only took me a few hours to make, even with the crazy piecing and it works extremely well to keep our french press coffee nice and warm to the last drop. And voila! 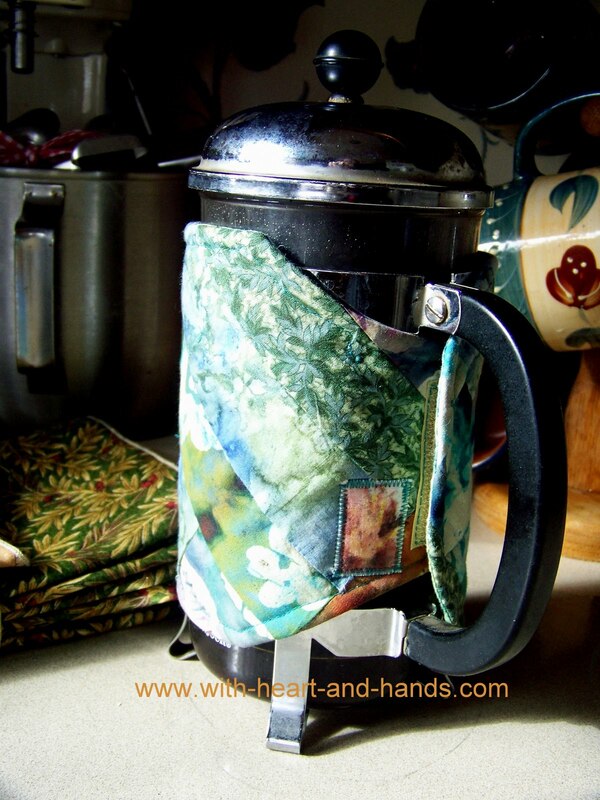 A nice, quilted, warm french coffee press wrap...to give or to keep...it's a wonderful Frugal Friday project created entirely from free leftover scraps! Still want to be frugal, but need some fabric? I also make these, but for coffee mugs and travel cups. I love my french press, and even have a special one for backpacking and camping to take. I catch a lot of heat about it, but everyone wants the coffee I make in it! Thanks for the quick lesson. I am making a couple tonight! Have a great week-end! That is just the cutest idea. I think I just might try making one. Awesome instructions too. A tea cozy for coffee--what an original idea. Awesome! Now, if I only had a coffee press! Would make a neat gift for someone else though!